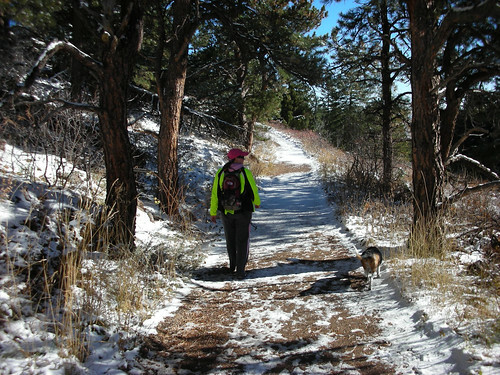 Fall hiking series continued today with short loop on the Mesa Trail. Kim’s knee is hurting so we wanted to stay off the big log steps as much as possible. The weather is definitely cooling so I want to be sure we get out when we can before it gets too cold for a baby out there. We headed up the Homestead Trail to start. Wanted to go up Towhee instead but you had to leash the dog and that is no fun. Especially because Wyatt is a moron and doesn’t know how to walk on a leash anymore — because we never do! Eventually Homestead turns into Towhee so we had to leash anyway. 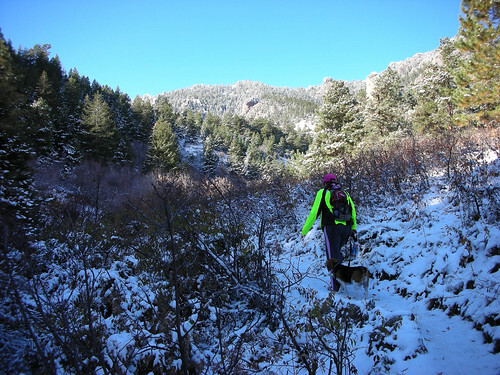 I kept telling Kim that Towhee is one of the prettiest trails around — but you don’t see it this time of year as much. The trail had patches of snow and ice the whole way up. Not a big deal but you would be walking and loose your footing quickly on some “black ice”. Not so obvious because it is all a millimeter thick just flash frozen day to day overnight. That climb was all Kim’s knee was interested in today so we turned on to the Shadow Canyon/Mesa Trail connector and descended. Looking back on the front range, you could see the snow up higher. 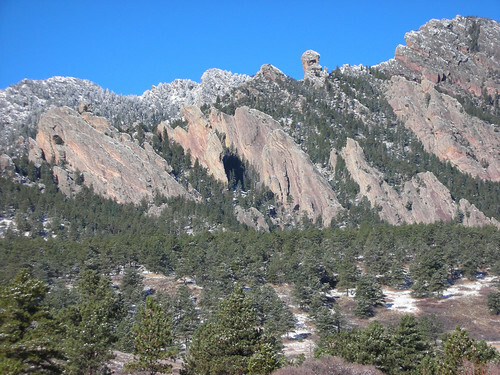 Here is also Devil’s Thumb and I think Mallory Cave is visible there too. I have yet to go up there. We were today until I read it isn’t a good climb in icy conditions. Saving that for another day. Wyatt just meandered right at our feet the whole day. I keep wanting him to go off and explore but he is a big wuss. 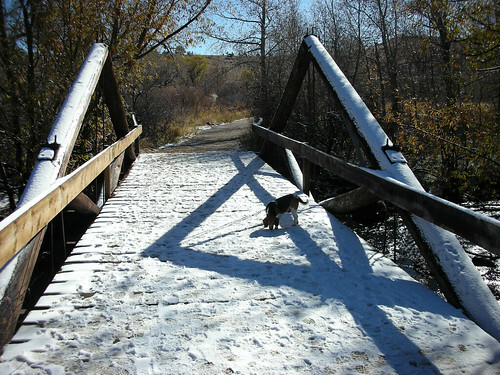 Although, he enjoyed getting a drink on the snow-covered bridge upon our return. Miss Bubbles (as Kim calls her) was all bundled up and never peeped the whole time. She just hangs there on my chest dead to the world. I do keep checking to see if she is breathing or not from time to time. Otherwise, another good outing but a little colder that expected. The wind chill was the unexpected factor today. We warmed up by getting some Larkburger and Starbucks afterward. Hopefully, Kim can get after that knee a bit this week so it gets stronger for next week. 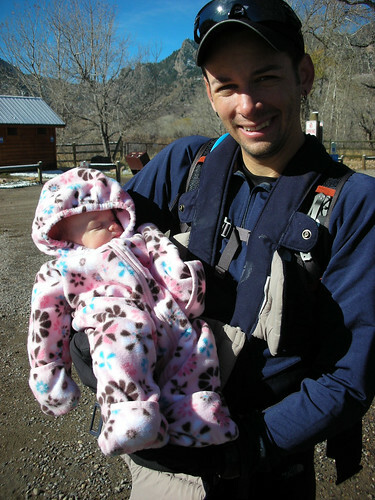 We went 3.13 miles with an elevation gain of 1,009 feet in 01:34:02, which is an average pace of 30:01. View my GPS data.